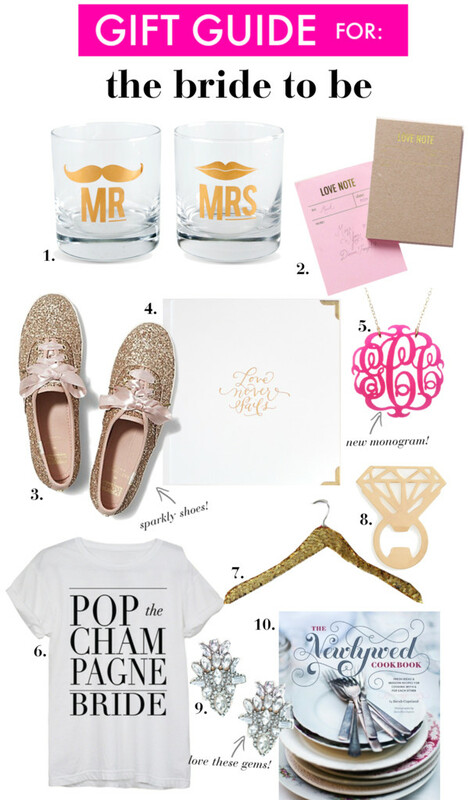 I had a lot of fun putting together this gift gift guide for the bride to be! Celebrating our engagement has been a blast and every thoughtful card and gesture has meant the world to me. These gifts would be perfect Christmas presents for anyone newly engaged or newlyweds. A gift with the bride's new monogram is always special for them as well as a present they can use for the big day like an organizer, sparkly hanger or celebratory tee. You can always volunteer yourself to accompany them for cake tasting too! Even if the wedding is a year away and the planning has barely begun, all of these will make her feel like a bride! I personally just picked up the sparkly Kate Spade x Keds sneakers and they are my favorite thing ever. I think they are going to be my official wedding errand kicks. My mom also just gave me the Southern Weddings Planner and it just the most beautiful (& useful!) thing ever- especially for fellow Type A brides - I'll be sure to share a review! I have to say, those glitter Keds are everything! I just want them to wear when my day needs a little more sparkle. I'm tempted to get that Pop Champagne Bride top now so I can have it for whenever I get married. Also - those glitter keds are incredible.